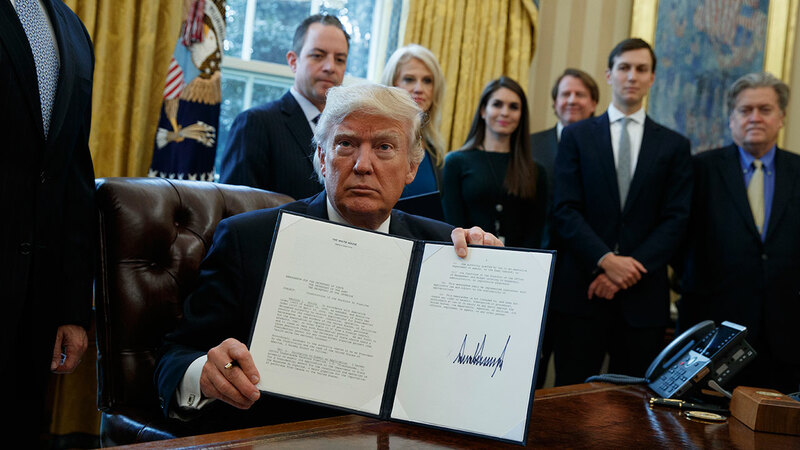 WASHINGTON -- President Donald Trump moved to advance construction of the Keystone XL and Dakota Access oil pipelines Tuesday, a pair of projects that were blocked by the Obama administration due in part to environmental concerns. Both orders are subject to renegotiations of the agreements. Looking ahead, Trump announced that he planned to nominate a justice for the Supreme Court next week, moving swiftly to try to fill the seat left vacant by the death of Justice Antonin Scalia. The president was summoning top senators to the White House later Tuesday to discuss his upcoming nomination. The pipeline is to carry North Dakota oil through South Dakota and Iowa to a shipping point in Illinois. Even as Trump moves to implement his agenda, he is still making false claims. During a reception with lawmakers at the White House Monday evening, Trump claimed the reason he'd lost the popular vote to Democratic rival Hillary Clinton was that 3 million to 5 million immigrants living in the U.S. illegally had voted. That's according to a Democratic aide familiar with the exchange who spoke on condition of anonymity to discuss the private meeting. There is no evidence to support Trump's claim. He made a similar statement on Twitter in late November that he had won the Electoral College in a "landslide" and "won the popular vote if you deduct the millions of people who voted illegally." Clinton won the popular vote by nearly 2.9 million votes but lost the electoral contest. Trump's assertion appears to be part of a continuing pattern for him and his new administration in which falsehoods overshadow his outreach efforts. On Tuesday, Trump summoned the heads of the big three American automakers, General Motors, Ford Motor Co. and Fiat Chrysler, for a breakfast meeting at the White House. He pledged to scrap regulations and reduce taxes on corporations that keep jobs in the U.S., though he did not specify his plans for either. His administration, he said, will "go down as one of the most friendly countries" for business. Trump's actions signal a reset after a tumultuous weekend dominated by his and his spokesman's false statements about inauguration crowds and their vigorous complaints about media coverage of the celebrations. While Trump's advisers have long accepted his tendency to become fixated on seemingly insignificant issues, some privately concede that his focus on inauguration crowds was unhelpful on the opening weekend of his presidency. In addition to his executive action on TPP, Trump signed memorandums freezing most federal government hiring - though he noted an exception for the military - and reinstating a ban on providing federal money to international groups that perform abortions or provide information on the option. The regulation, known as the "Mexico City Policy," has been a political volleyball, instituted by Republican administrations and rescinded by Democratic ones since 1984. The actions were among the long list of steps candidate Trump pledged to take on his opening day as president. But other "Day One" promises were going unfulfilled, including plans to propose a constitutional amendment imposing term limits on members of Congress and terminating Obama's executive actions deferring deportations for some people living in the U.S. illegally. Associated Press writers Darlene Superville, Ken Thomas, Erica Werner, Jonathan Lemire and Jill Colvin contributed to this report.